The SonoSite M-Turbo ultrasound is widely known as one of SonoSite’s most versatile ultrasounds, capable of providing images for a wide range of applications, including abdominal, nerve, vascular, cardiac, venous access, pelvic, and superficial imaging.Through features such as SonoADAPT™ Tissue Optimization, SonoHD™ Imaging Technology, SonoMB™ Multi-beam Imaging, and more, the M-Turbo ultrasound gives you striking image quality with sharp contrast resolution and clear tissue delineation. In terms of workflow integration, the SonoSite M-Turbo features DICOM Storage Commit, Patient Management, and a USB Bar Code Reader, among others. We remain big fans of the SonoSite lineup of portable ultrasounds. 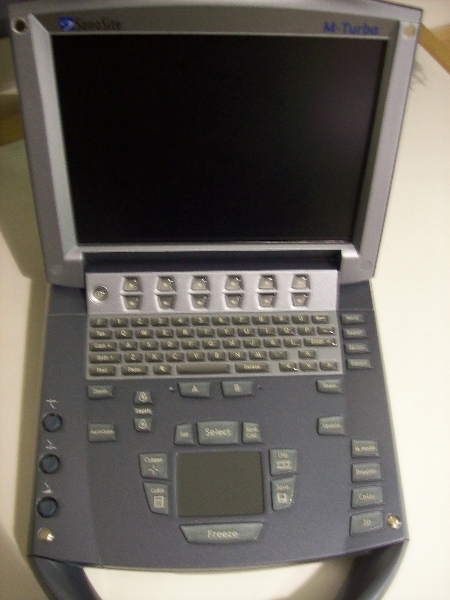 SonoSite ultrasound machines are most commonly used by physicians who use it as a tool to accomplish a task (such as needle guidance, identifying tissue damage, etc), and the ultrasound is used to assist in achieving a task or confirming a diagnosis. In most situations, the M-Turbo is ideal in situations that do not require a lot of measurements nor special preset customizations. The SonoSite M-Turbo is well-designed for the physician market and takes away a lot of the complex buttons, knobs, and complex menus found on most portable ultrasound machines.